Double edge razors are for those people who need a perfect and clean shave every time they shave. It is for those minimalist and traditionalist people who love to do the job the old school way. The double edge razors also provide a cheaper alternative as the blades are almost costless and can be easily replaced without having to spend a lot of dollars for a single piece of a blade. We have looked into some of the best double edge safety razors available in the market and have selected a few of them which we have found to be the best in the market. This product from WowE is an eco-friendly razor and has been fitted with a sleek bamboo handle. The fact that even the packaging the razor comes in is made of recycled materials make it a truly eco-friendly product. The company sells the razor with 5 additional Bic blades within the package so that you will not have to worry about it initially. High safety is guaranteed while using this product and the fact that the handle is long gives more precision while shaving and reduces the risk of injuries. The various features of WowE Double Edge Safety Razor have been listed below. Edwin Jagger is one of the most famous brands in the area of shaving products and has an impeccable legacy. This specific product from the company comes with a chrome body that ensures the durability of the product. The handles have embossed stripes on it so that the handle does not feel slippery even in wet conditions. 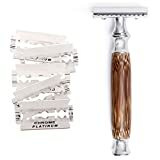 The company provides great customer support for their product and even provide a set of 5 blades along with the razor. The various features of Edwin Jagger Double Edge Safety Razor have been listed below. With an experience of over 100 years in the field of making shaving products, Merkur is indeed a force to reckon with. This specific product from Merkur is made with a handle of 4 inches which makes it comfortable and easy to control even for big hands. The weight of the razor is quite balanced which makes it easier to shave precisely. The handle of the blade has also been knurled to give control when wet. The company guarantees a lifetime warranty for the product. The various features of Merkur double edge safety razor have been listed below. Oak Leaf Butterfly Double Edge Safety Razor is a high-quality product made of alloy and is designed to last long. Built with a decently long handle, this double razor is easy to handle and provides a consistent shape. The product comes with 3 additional blades in the package. The design makes it pretty simple to open and swap the blades. The various features of the razor have been listed below. 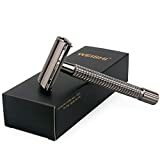 Perfecto Professional Double Edge Safety Razor is the one-stop solution for all those suffering from various irritation and burns in the face after shaving with a regular razor. The product is fitted with a 3.5″ handle to make it comfortable to grip for those people who have a bigger hand also. The body of the razor has been balanced pretty well to ensure that the users have maximum control while using the product. The company also guarantees a money back policy in case the customer is not satisfied with the product. The various features of Perfecto Professional Double Edge Safety Razor have been listed below. 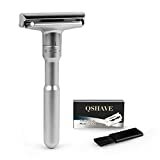 This adjustable double edge razor from QSHAVE is of the highest quality and allows the users to adjust the exposure of the blade on a range of 1 to 6. The product has a great design as well which ensures you would not lose your grip while shaving. A 3.5″ handle is fitted to the blade to provide maximum precision while shaving. The razor also comes with a pack of 5 blades which have been coated with titanium. By buying the upgrade version of the product for a small price difference, the user gets a stand and a leather sleeve for the blade along with the razor and blades which is a pretty good deal. The various features of the product have been listed below. Elkaline sells this product with a lifetime warranty which shows the high-quality of the product. This double edge razor has been designed to be used by not just men but by women also. The product is sold along with a stand for keeping after use and also a case to carry the razor around while traveling around which makes it perfect for people who travel a lot. 5 additional blades are also included in the package for the first few days of use. The various features of Elkaline Double edge razor have been included below. This classic 2 pieces double edge razor from Merkur has more of a traditional design with a short and thick handle along with a heavy blade head. The heavier head will ensure that the process of shaving can be effortless. The handle of the razor is knurled to provide superior grip and greater precision for the user while shaving. The various features of the Merkur Classic 34C Double Edge Razor have been listed below. 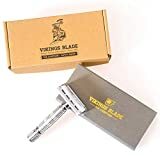 Vikings Blade is a pretty big name when it comes to shaving products and they have not let down their customers with this product either. This razor with a butterfly opening design makes it convenient to switch blades without any hassle. Included in the package is a carrying case made of Alcantara, which also has a mirror to be able to shave on the go. Premium blades made in Sweden have also been included. The various features of VIKINGS BLADE The Chieftain Safety Razor have been listed below. This product from Weishi is an ode to the traditional double edge razors and is provided with a long handle. Having made the convenience of their customers the priority, the razor has been designed with a butterfly opening system. The package also includes a set of blades for the initial uses. This product has been made with high-quality materials and the long handle makes precision shaving a lot easier. The various features of the product have been listed below. These are some of the best double edge razors we have found available in the market. 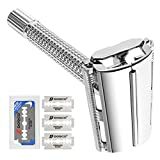 After thinking about which type of razor would be perfect for you, go ahead and buy one and get rid of skin irritation and burns, once and for all after shaving.